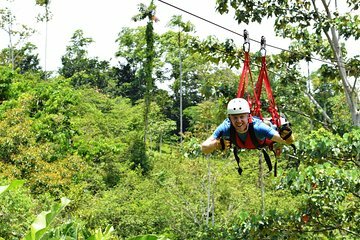 Monkey around in Costa Rica's Caribbean rain forest on a thrilling canopy zipline tour. Venture inland from the coast to a base camp at a local farm, where professional instructors help you gear up and guide you on a dynamic course of 21 platforms and state-of-the-art carbon fiber cables. Crisscross the jungle at various levels, and learn about native plants and animals while trekking along tropical trails. Finish with an extra adrenaline boost on the Tarzan swing and ultra-long Superman cable.